Leopards of all the big cats, leopards are the best climbers. In fact, they spend most of their lives high in the trees. They can climb while upside down on branches and even climb down trees headfirst. Your cat probably doesn’t like water, but leopards do. They are strong swimmers. Leopards are the best climbers but that’s not all about leopards! Leopards live in Africa and Asia. People hunt them and destroy the forests and jungles that are their homes. Leopards are endangered animals. 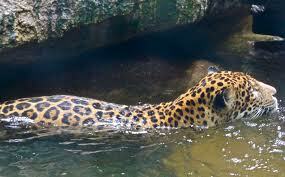 All about leopards, cats that are strong swimmers. Leopards are nocturnal. They hunt mostly at night and lounge around during the day. They carry their prey up into the trees to keep it safe. They can even carry heavy animals. 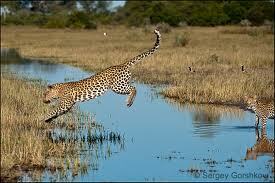 Leopards can run 36 miles per hour and jump 10 feet high. Imagine how they’d perform on field day! Leopards are carnivorous. They eat deer, fish, birds, lizards, wild pigs, monkeys and even porcupines. Leopards don’t need to drink water. They get moisture from their food. Endangered: This animal needs our help to survive or it might become extinct. A National Geographic documentary about the wild lives of leopards. Question: How big are leopards? Answer: Males weigh 80 to 200 pounds; females weigh 60 to 130 pounds. Question: Do leopards live in prides? Answer: Leopards live alone, except when a mother is raising cubs. Question: Do leopards have good hearing? Answer: Leopards can hear five times better than humans. They can hear tiny mouse squeaks. 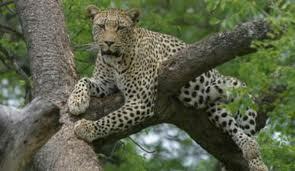 Enjoyed the Easy Science for Kids Website all about Leopards info? Take the FREE & fun Leopards quiz and download FREE Leopards worksheet for kids. For lengthy info click here. Declan, Tobin. " Fun Leopard Facts for Kids ." Easy Science for Kids, Apr 2019. Web. 23 Apr 2019. < https://easyscienceforkids.com/all-about-leopards/ >.